For a relaxing night in your spa you can’t go with out the InSPAration aromatherapy system range. Available in many different fragrances (and sizes) this range of aromatherapy can be used in any spa. Simply pour required dosage of InSPAration into your spa for immediate aromatherapy. Fragrances Available: April Showers, Cherry Blossom, Coconut Lime Verbena, Coconut Mango, Cucumber Melon, Eucalyptus Mint, Hawaiian Sunset, Heavenly Honeysuckle Joy, Mangosteen and Goji Passion, Peach, Polynesian Paradise Pomegranate, Rain, Spaberry, Spring Bouquet, Tahitian Tropic, Tranquility and Tropical Island. For a relaxing night in your spa you can’t go with out the InSPAration aromatherapy system range. Available iSit back and relax in your Oasis spa with the Oasis aromatherapy system. Oasis Spas include (on selected models) an adjustable essential oil aromatherapy system. Simply put desired fragrance into spa dispenser (air blower), adjust aromatherapy system for strength of fragrance, then sit back and relax. Remember to turn off your aromatherapy after use. PLEASE NOTE: Oasis aromatherapy can be used on most Oasis spas. Fragrances Available: Citrus Sorbet, Eucalyptus, Evening Musk, Lavender, Peach Passion, Pina Colada, Sandalwood Spice, Summer Orchard and Wildflowers.n many different fragrances (and sizes) this range of aromatherapy can be used in any spa. Simply pour required dosage of InSPAration into your spa for immediate aromatherapy. Spa-Rite has a range of different beaded aromatherapy available. Simply pick a fragrance, insert beaded aromatherapy into your spa dispenser (air blower) and sit back and relax in your spa. 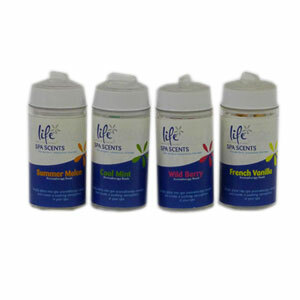 Spa Life Scents Fragrances Available: Cool Mint, French Vanilla Summer Melon and Wild Berry.